Obviously this page is more for the brands than for the standard kitesurfer but if you want to know more about the new technology, you are welcome. The sail and bridles are common manufacturing knowledge so I won't talk much about them. 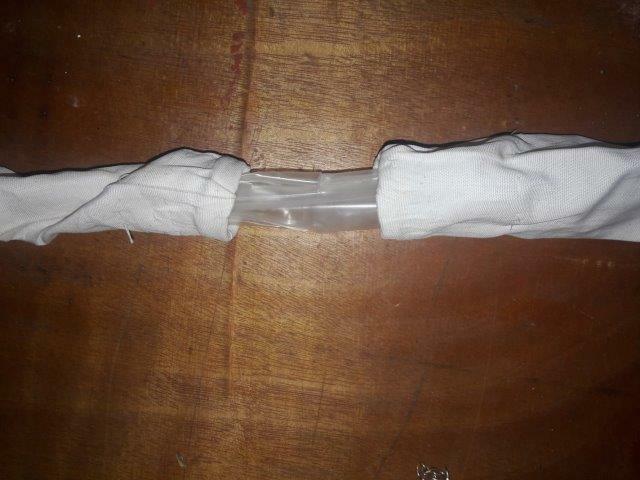 Hoses are put inside sockets that are wider than the tubes, made of very light fabric as there is no strain on them. - a weaving machine builds a cylindrical hose. This is a rather costly process as it takes time to do it. The advantage is that it is perfectly homogeneous, without any weak point, so it should come straight. - a band of fabric is weaved then folded in its length then the two edges are sewn together with a special machine. It is so well done that it is almost invisible and as strong as the previous method. In this case, the hose will probably bend. - fibers are oriented in the length and in the diameter. From my understanding, hoses with fibers oriented for example at 45° or 30° won't work. Depending on the pressure, my hoses slightly change in diameter (no problem) and length (can be a problem). Try to develop tubes which change their length as little as possible. For safety reasons I have not yet tested the maximum pressure I can put in these tubes but it has to be made in order to chose the correct fabric weight. Find a manufacturer who can make cylindrical PU bladders without weldings, of same or smaller diameter as the hoses. For my protos, the bladders were made with the same PU film as classic inflatable kites and it works fine. No need to use a thicker material. Insert the bladders inside the hoses or ask your supplier to deliver both together. He may find a way to do so. Before closing the 2 ends of the inner tube, you have to install a valve. I use Presta type ones, they are light, allow easy deflating and can be installed with a nut on each side after placing metal and/or rubber washers. 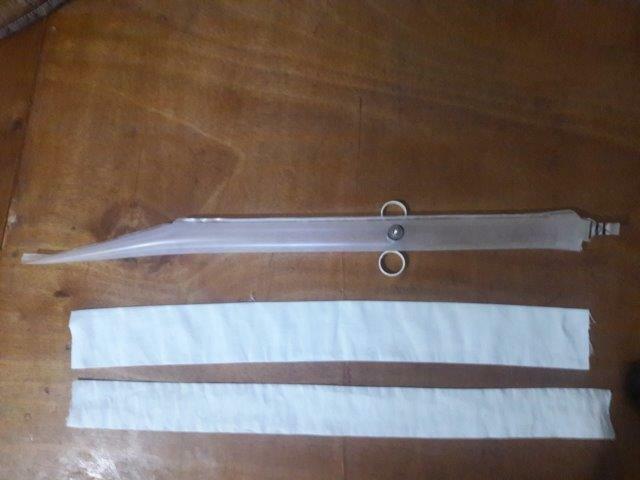 Last advantage : you can perforate the fabric tube without damaging any fiber so that the tube won’t lose strength. It wouldn’t be the case with a Schrader valve. I preferably place the valve at 30cm from the rear end of the struts to moves back the Center of Gravity. Close the ends of the struts : there are different ways. One solution would be to develop a plastic piece where air pressure reinforces the tightening. It would not be necessary to weld the bladder ends. It would be quick to install, clean but may be heavier. - I perforate the fabric with the valve. It can have different diameters, for example a larger one for the LE and a smaller one for the tips which have a much smaller arc shape, and for the TE. ​- I put both rings side by side. I can inflate ! That’s an invention on its own that will be difficult to find an alternative​. Determining the sizes of the tubes before asking a supplier to make them.